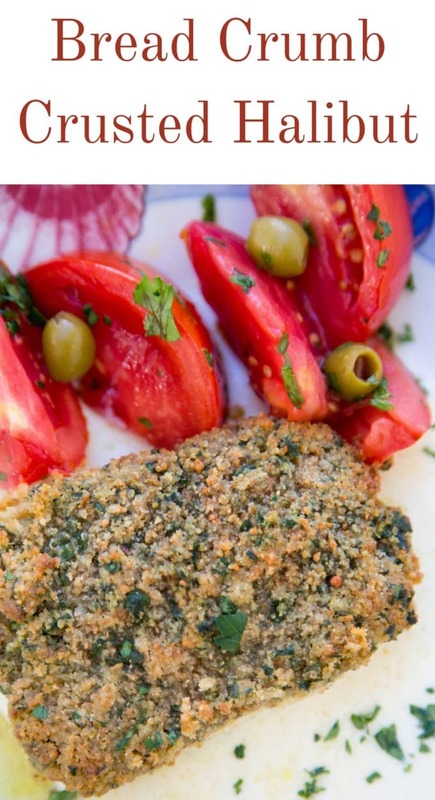 Halibut is one of my favorite fish and my light and flavorful bread crumb topping is a delicious and easy way to prepare it. 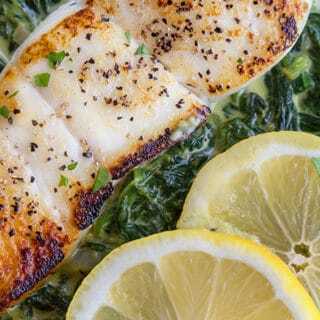 Add in lemon beurre blanc and you've got a delicious restaurant style dinner! I have always loved halibut, but it’s not always available in the stores I shop in so when I see it, I buy it. 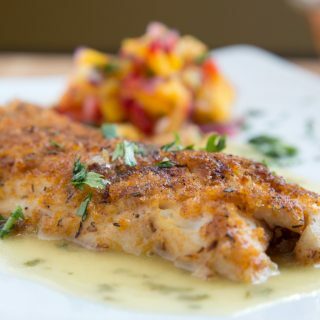 I know you’re going to love my recipe for my Bread Crumb Crusted Baked Halibut, and if you’re looking for another delicious way to serve halibut, check out my Pan Seared Halibut with a Garlic Crab Topping. 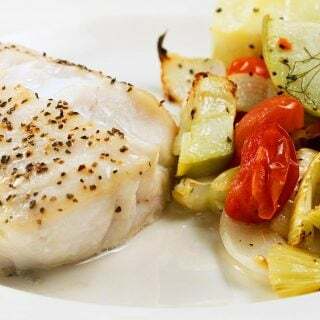 As part of my new healthier lifestyle, I’ve been adding more fish to my diet, simply roasting or grilling with sea salt, black pepper and olive oil. But as you can guess with my restaurant background I tend to do a little more than simply roasting from time to time. 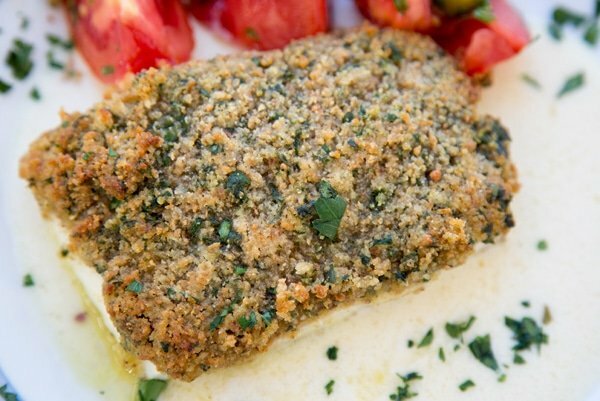 My Baked Halibut crusted with a mixture of bread crumbs, aged Romano cheese, lemon zest and parsley may be just a little over the top with the butter I used for the breadcrumb mixture, but it certainly was delicious and worth the occasional splurge. While shopping at Sam’s Club I found IQF Alaskan Halibut in a 1.5-pound bag, it was still a little pricey but definitely worth the purchase. The Halibut I got at Sam’s Club was better than Halibut I had served at a very nice restaurant in Virginia, it had mild, sweet tasting white flesh, large flakes and a firm but tender texture. The Halibut I had at the restaurant was a bit mushy and quite expensive. So why bother going out when you can make something this good at home. The mixture was fairly easy to make and added a lot of flavor to the dish. You can use less if you desire, but Lisa and I really enjoyed the full layer of breadcrumbs. You can see in the picture how wet the stuffing looks before baking. I added a little water to the bottom of the pan to help keep it moist and cooked the fish for only 15 minutes. Be careful not to overcook the halibut! To compensate for the extra butter in the topping our sides were a little lighter, enjoying a tomato salad and green beans. Since I had used so much butter in the stuffing I decided to make a quick and easy version of a classic beurre blanc, using a lot less butter and half and half instead of heavy cream. It went very well with the halibut but because of how it was made it may begin to break on you. This is where the heavy cream would have been of more help than half and half, but since I didn’t have any heavy cream on hand I made do with what I had. Guess what? It was still delicious! Of course, if you’d like to serve it without the sauce, you’ll still enjoy the full flavors of the dish and breadcrumb topping. 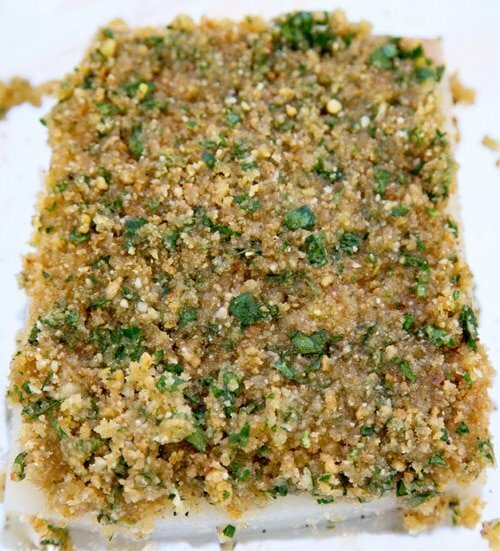 In a bowl, combine the bread crumbs, Romano cheese, parsley, lemon zest, black pepper and melted butter. Mix well to incorporate all the melted butter. 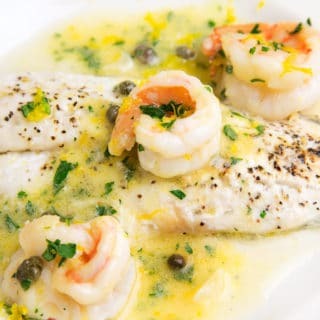 divide mixture evenly between the 4 fillets and spread out in an even layer on each fillet. 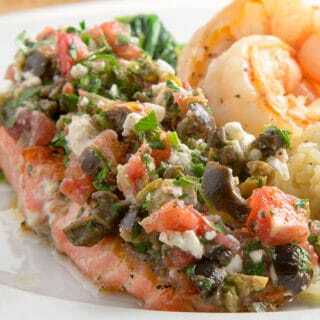 place fillets on a non stick baking dish, adding a little water to the bottom of the dish to help keep the fish moist. 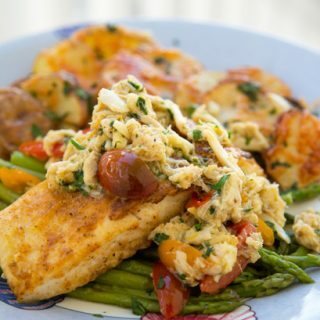 Place 2 tablespoons of lemon beurre bland on the dish and top with finished halibut, serve with your favorite sides. Combine white wine, brown sugar, salt and pepper. Simmer uncovered until cooked down (reduced) by three-quarters. Stir in lemon juice and lemon zest and turn heat down to low. Stir in the half and half (or heavy cream) and allow mixture to heat without causing it to break. If you used heavy cream the consistency will be good, if you use half and half you may need to let the mixture reduce a little longer. Absolutely drooling!!! I must try this!!! We are heading to Hawaii this weekend and I’m mentally planning the fish markets I will be hitting up while we are there and the recipes to make with them!! Thanks Maria, I hope you get to try this soon! Have a great time in Hawaii!! I just returned from Alaska with 30 pounds of halibut. I am looking for ‘different’ recipes, and this one looks like a keeper! Thank you. By the way.. When you say a ‘little water in the pan”, are you talking about a tablespoon or so? hi Nan, I hope you enjoy the recipe and I’m envious of all that delicious Halibut! I always add a few tablespoons of water the bottom of the baking dish to help keep the fish moist. I’ve also used a splash of wine from time to time. Some will get absorbed but the rest will mingle with the juices that run off, leaving you will a little pan sauce for the fish. It’s easy to forget simple when you have a love of cooking. This looks delicious. It really was delicious Mary Frances, thanks for stopping by!